So recently, I went back to KENJO Salon for another hair curling and treatment session! I previously did a Volume Rebonding C Curl treatment with them a few months back, and since I wanted to give my hair a more voluminous finish, Joseph opted for a S Curl for me this time! The session first started off with a trim before the curling began! The curling process was done using MUCOTA Omega Oil Therapy - another treatment that I really love doing at KENJO Salon because it always leaves my hair feeling so soft and smooth! As you might already know from my previous blog posts with KENJO, I've always done C Curls with them which, well, might have gotten a little boring after a while. Adding S curls to my hair makes it easier to maintain, since I'll only have to tie my hair up into a bun before I sleep to wake up to voluminous curls the next morning! Joseph also added the Flashcolour Luminesta treatment for me to brighten up my hair colour. Granted, it doesn't work like the usual hair colour but it brightens up my hair for up to 2-3 weeks! Can't wait to go back to the salon for another dye after the treatment fades! The curling was already completed at this point of time and you can tell the difference from the previous times I curled my hair! Waiting for the treatment to sit before another wash and blow-dry! The whole process (curling and treatment) took around 4 hours or so, and sometimes I really do admire the patience these hairstylists have! Haha, it's not easy to give your customers beautiful hair. Check out the refreshed colour! Heh, I've had friends who asked if I dyed my hair again but nope, the treatment really worked wonders for me. Plus, it gave my tresses a really soft finish and made them really manageable even after curling! They say that your hair will become really frizzy after all the heat that has been added during the curling process, but it has been a week since I curled them and they're still looking as good as ever! The salon also gifted me with the MUCOTA Aire+ Shampoo series to review! Prior to using these shampoos, I gave them a Google search and found out that they have a whole lot of series that can be used on various types of hair. I got the shampoos in 01, conditioner in 03 as well as the leave-in hair treatment in 06 for curled hair. The MUCOTA Aire+ shampoo contains a lot of cleansing ingredients which are scalp and hair-friendly. It also contains CMC Amino-acid which can improve the hair texture drastically when washed! Not only does it give the hair volume and a smooth texture, it also comes with a refreshing aroma of apple and peach! The treatment smoother, or conditioner as we call it, contains collagen, ceramide, and lots of honey which help keep moisture inside the hair. Also, it has Shea butter and jojoba oil to prevent the hair from dryness whilst maintaining moisture balance in the hair! The treatment smoother is to be used after rinsing off the shampoo, and it'll be good if you can leave it on for around 5-10 mins for it to achieve the best effect! And lastly, my holy grail. Honestly, ever since using the Veil For Wave product from the MUCOTA Aire+ collection, my hair has become extremely smooth and very easy to manage. All I do is pump a little after washing my hair while it's wet before using the hair dryer to blow it dry! If you're not someone who uses the hair dryer, you can also leave it on after washing your hair. And yup, 1 pump is all it takes! Heh, I love how the scent reminds me of the sweet aroma of mangosteen! This product is also perfect for damaged hair that has lost it's CMC and proteins repeated dyeing or perming. The lost of CMC and proteins can cause split ends and breakage because undernourished hair becomes dry easily. Therefore, this product improves the hair from both inside and out, supplying honey, nano-sized CMC, and PPT proteins (keratin, collagen, and silk) to the tresses. It can also control hair volume and gives the hair a manageable texture. Major love for the S curls! 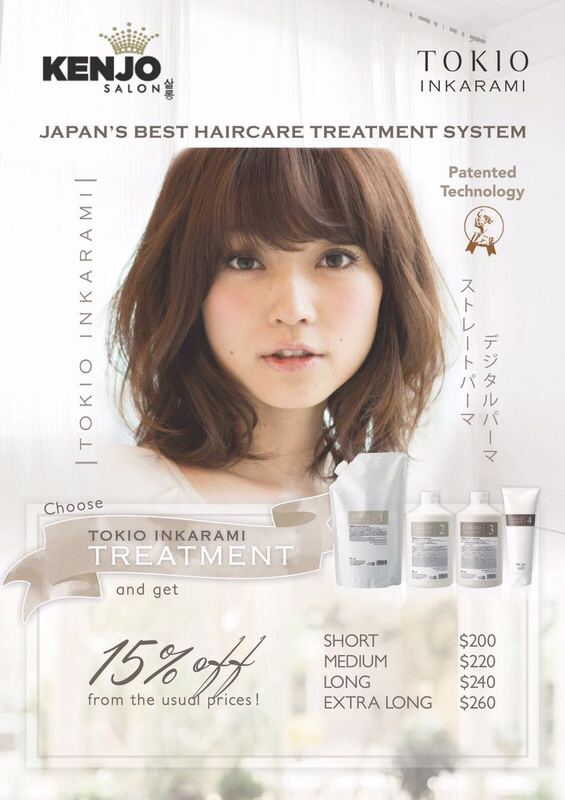 Heh, can't wait to update you guys when I go back for my next hair dye and try out the latest Tokyo Inkarami treatment! Oh and for my readers, here's a special promo for you! You can also quote "CASSANDRA' to enjoy 15% OFF all ala-carte services!